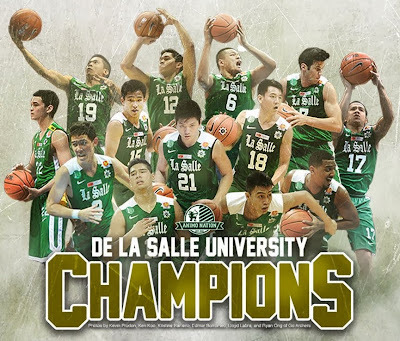 De La Salle University celebrates a shining green victory for being champions in the University Athletic Association of the Philippines (UAAP) Season 76 Men's Baskteball and Women's Basketball. 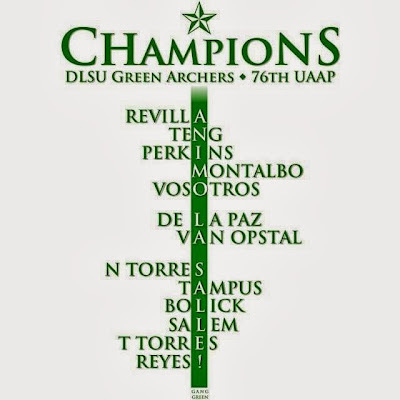 The University holds the Animo Night, a thanksgiving party for the athletes and their coaches on October 17, 2013 at the Henry Sy, Sr. Hall grounds. It's also a celebration of all DLSU sports teams who competed and won in the first half of the UAAP Games. It will also be a send-off activity for the teams which will compete in the second half of the UAAP season. The party is open to all members of the Lasallian community, including alumni and their families. Please present your DLSU ID or Alumni Card to enter the campus. Classes in all campuses will be suspended from 4:20 p.m. onwards to give everyone the opportunity to join the activity. All are enjoined to attend the Thanksgiving Mass that will kick-off the celebration. Merchandise will be sold. Part of the proceeds will go to relief operations for the Visayas Mindanao Earthquake and One La Salle Scholarship Fund.